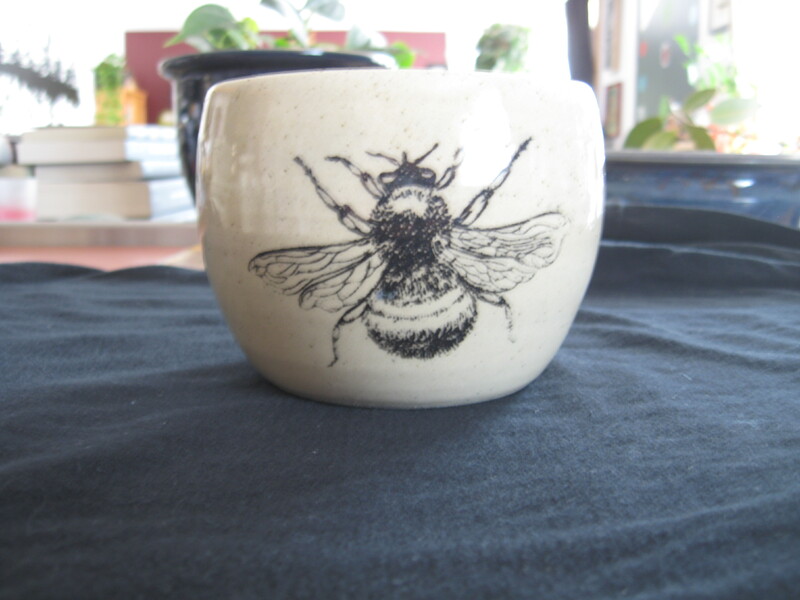 This marvelous mug displays a delicate bumblebee. All mugs are roughly 16 oz. / 500 mL / 2 cups in size. 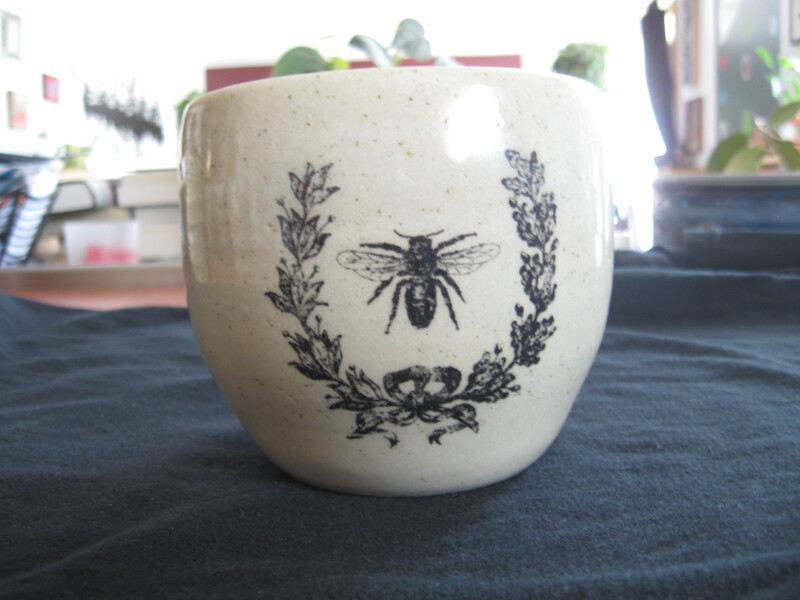 This marvelous mug displays a wee honey bee and a laurel. It is 16 oz. / 500 mL / 2 cups in size. 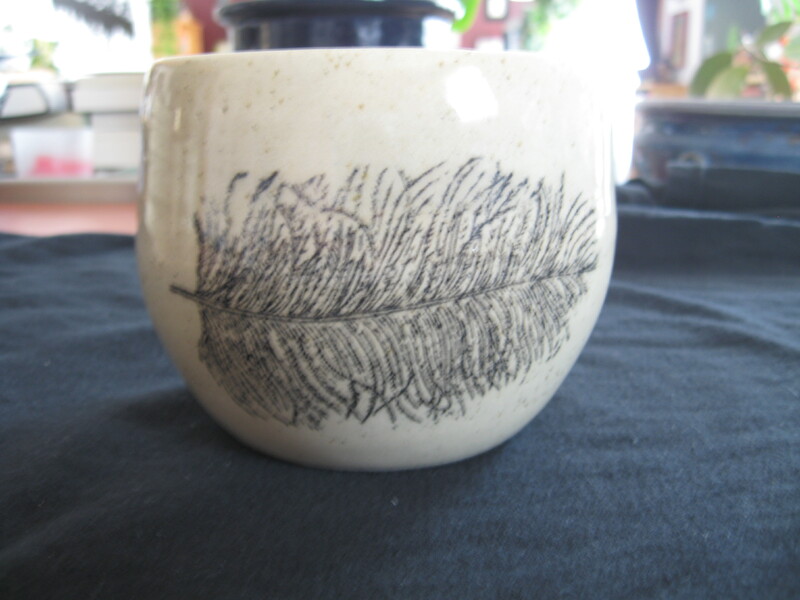 This marvelous mug displays a feather plume. All mugs are roughly 16 oz. / 2 cups / 500 mL in size. 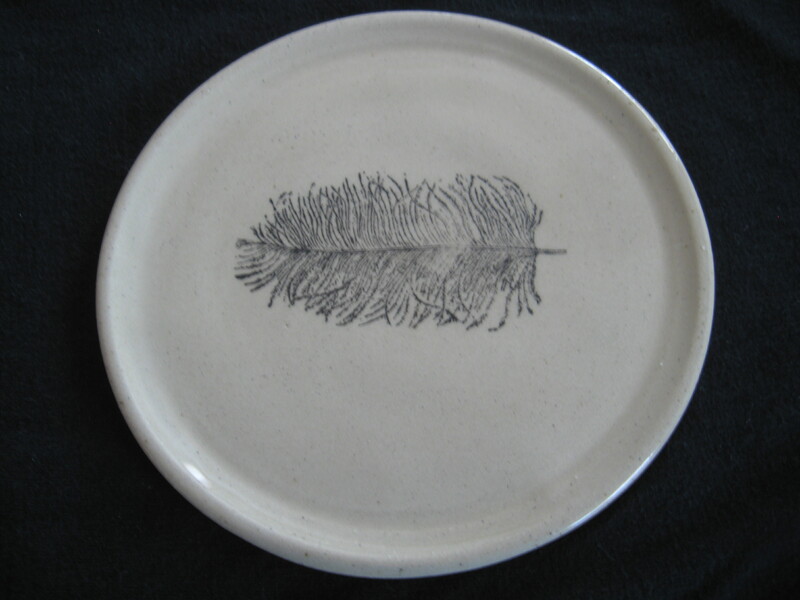 This large precious plate is adorned with a plumed feather. I measures roughly 9″ in diameter. 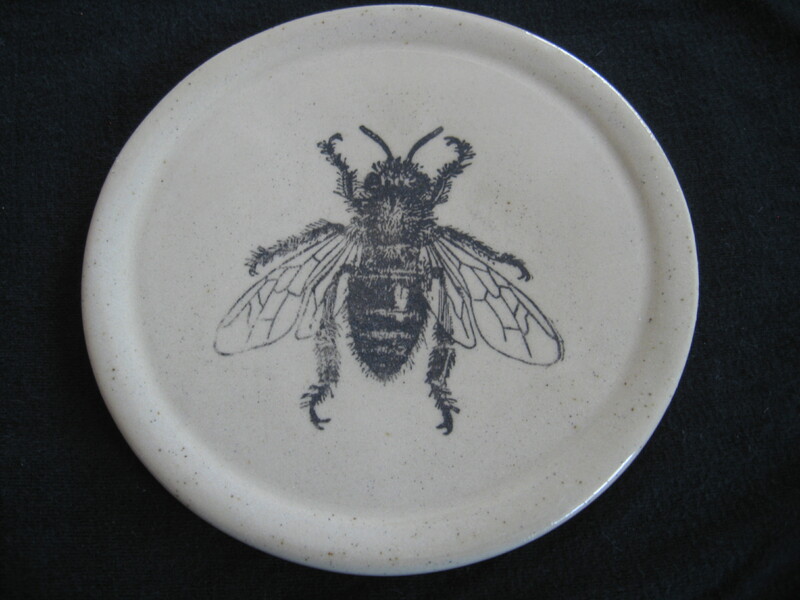 This small precious plate / coaster displays a furry honey bee. It measures roughly 5″ in diameter. 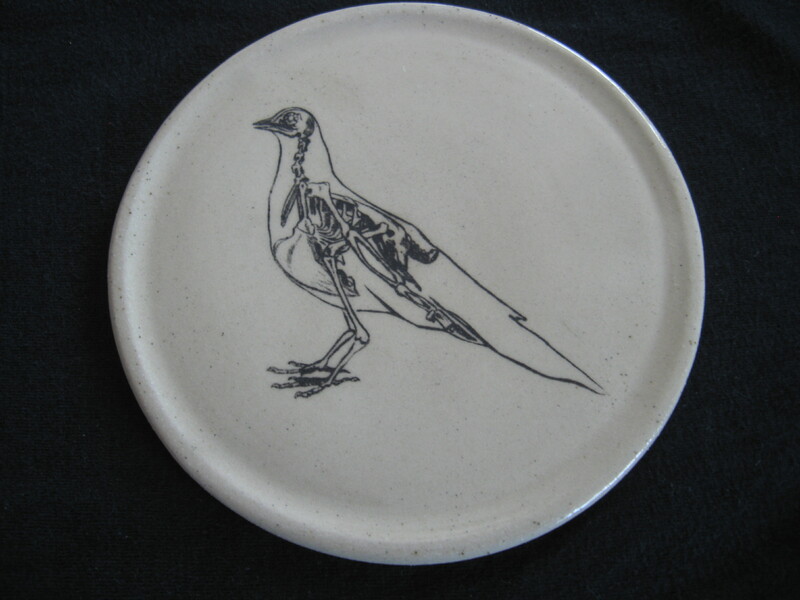 This medium sized precious plate displays a pigeon skeleton and measures roughly 7″ in diameter. Remember, this and all other images can be placed on any size or type of pottery treasure. 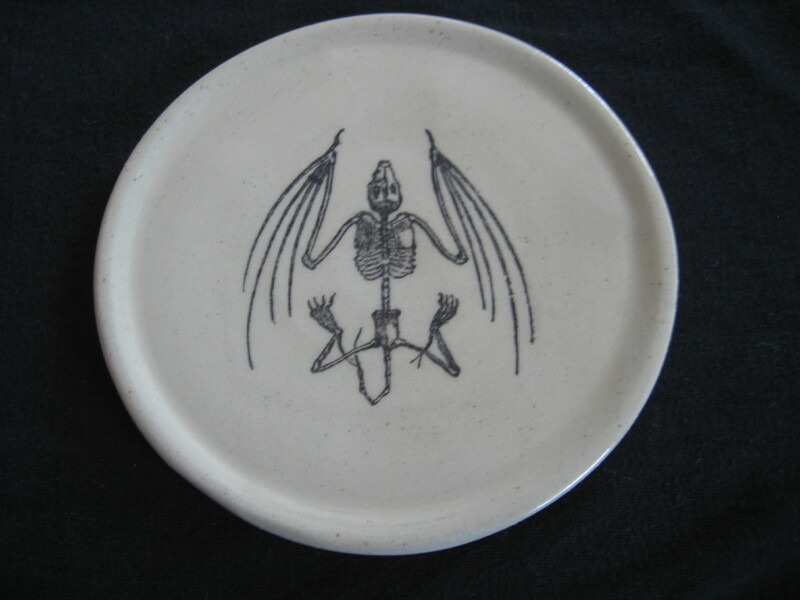 This large precious plate is adorned with a lovely bat skeleton. It measures roughly 9″ in diameter. 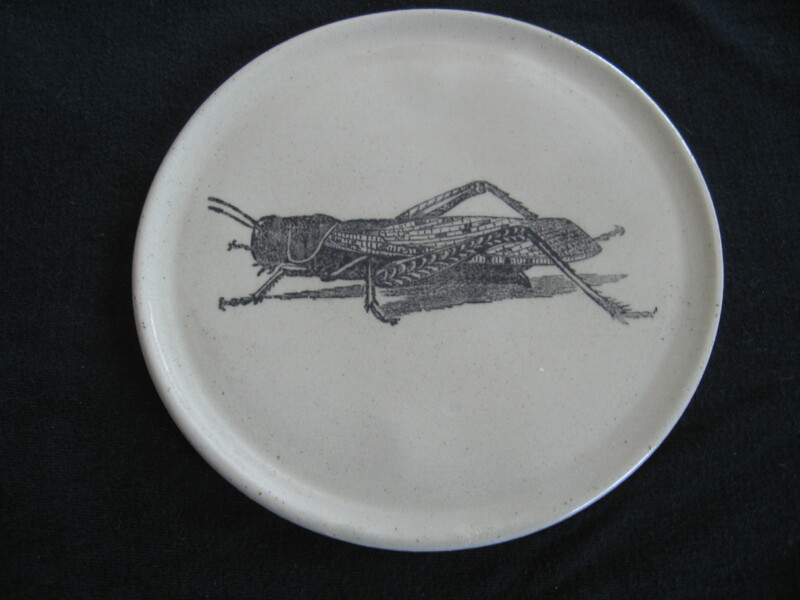 This small precious plate / coaster displays a grasshopper and it measures roughly 5″ in diameter. 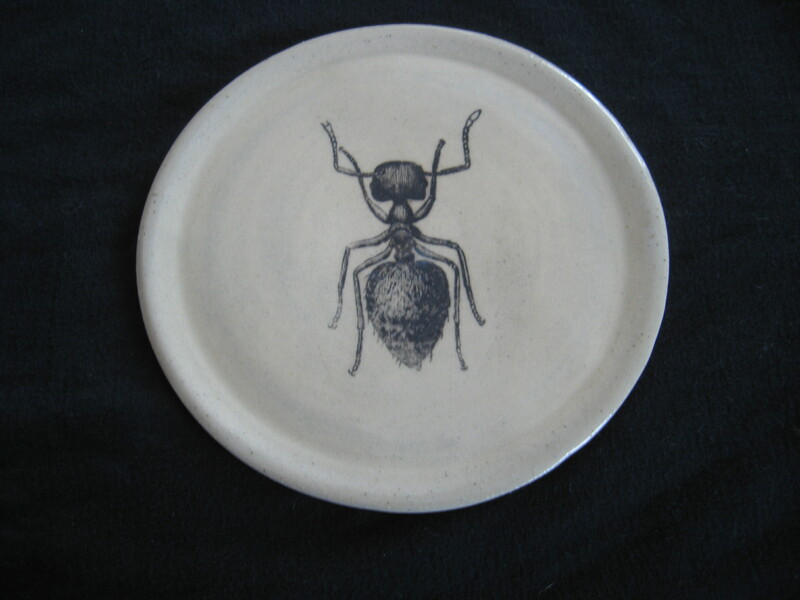 This small precious plate / coaster displays an ant ready to march. I measures roughly 5″ in diameter. 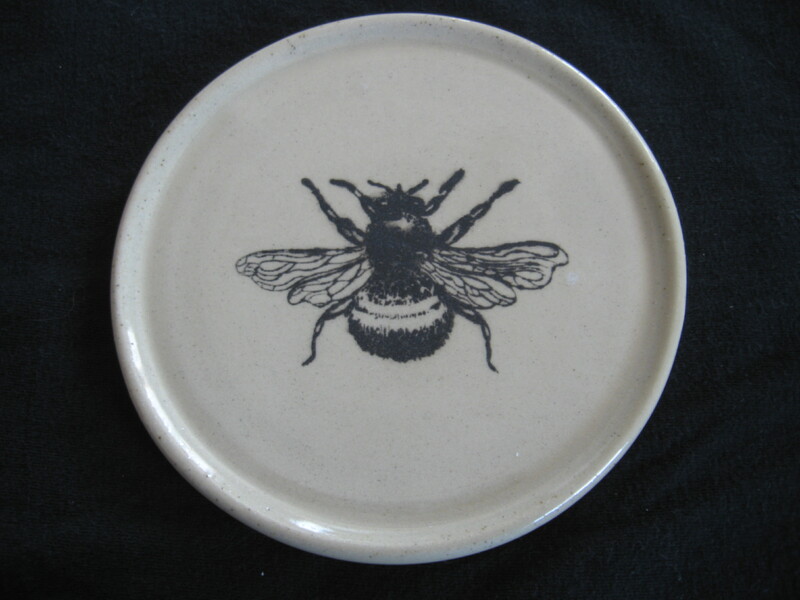 This small precious plate is adorned with a delicate bumblebee and it measures roughly 5″ in diameter. 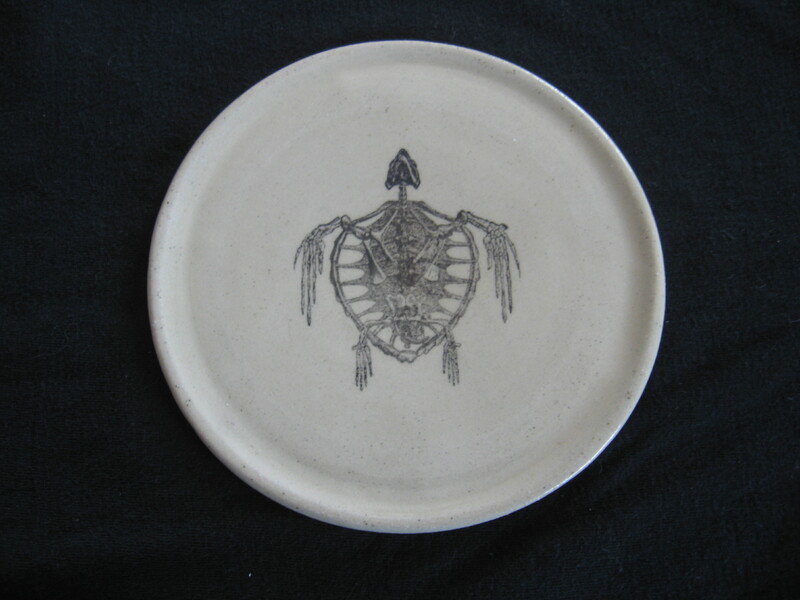 This small precious plate displays a tortoise skeleton floating on its surface (but not really because the image is stained into the clay itself). It measures roughly 5″ in diameter. 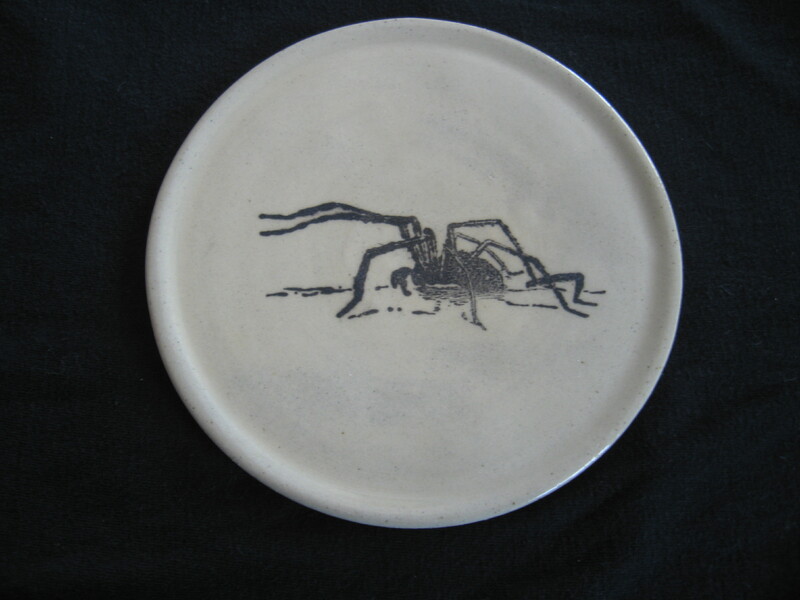 This small precious plate displays a creepy crawly of a spider adorning its surface. It measures roughly 5″ in diameter. Please note your shipping costs will depend entirely on where you are located and what items you purchase. 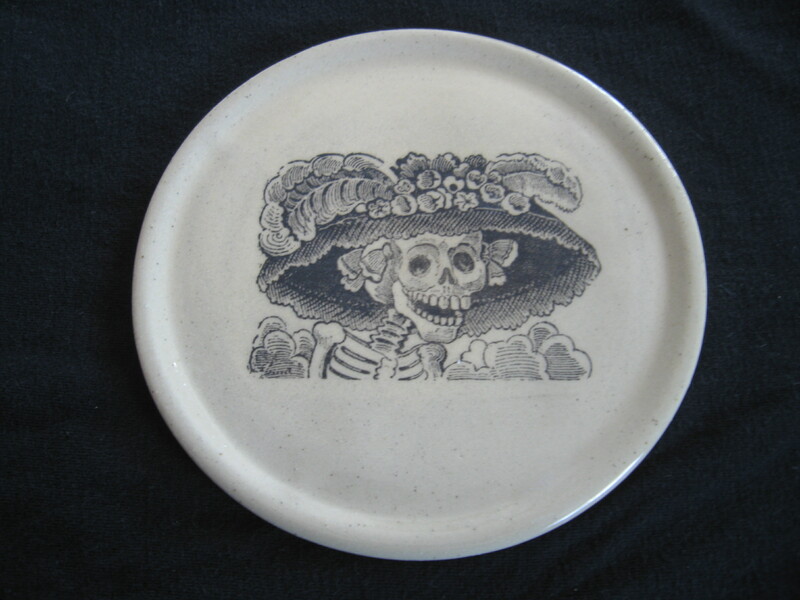 This small precious plate displays a lady of the day of the dead. It measures roughly 5″ in diameter. 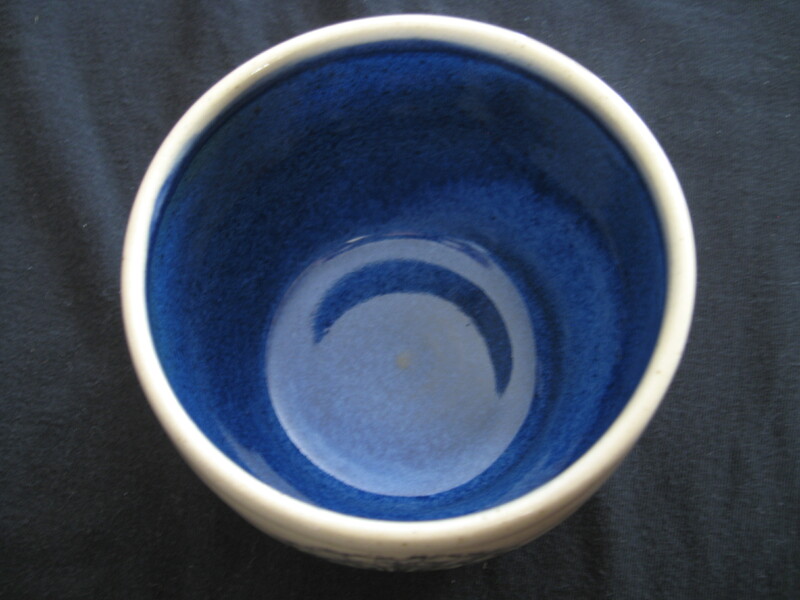 As with all pottery treasures, the shipping costs will depend entirely on your items and the geographical location. 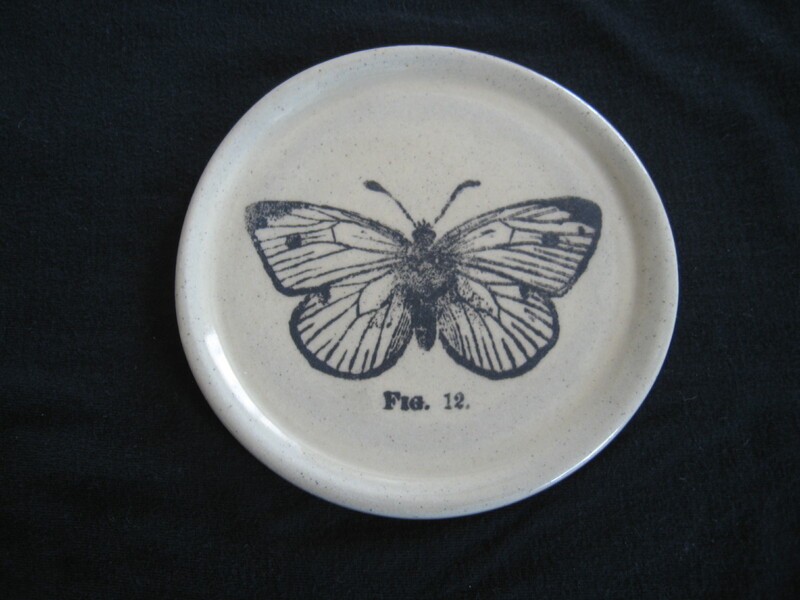 This small precious plate displays a delicate butterfly. It measures roughly 5″ in diameter. As with all pottery treasures, the shipping fees are entirely dependent on your geographical location and the particular items you buy. 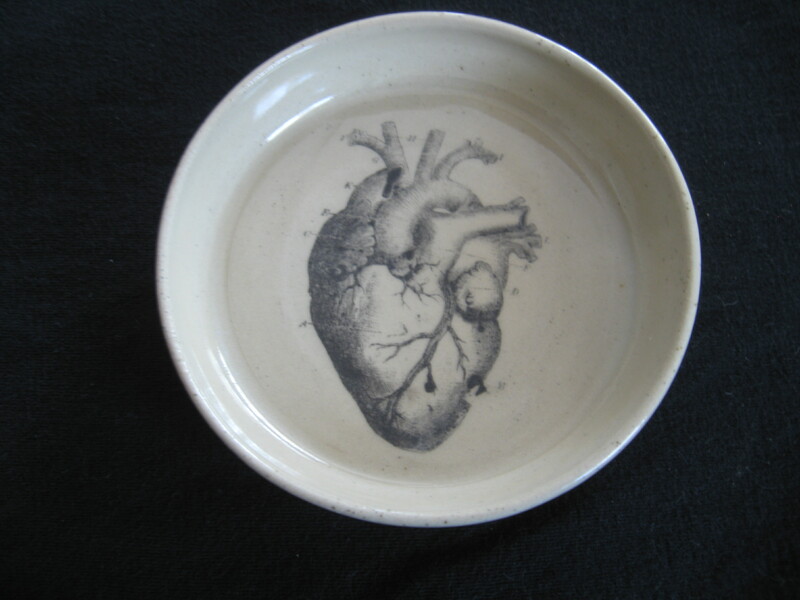 This medium beautiful bowl displays an anatomical heart. It measures roughly 6″ in diameter and 325 ml in volume. As with all images, this can be placed on any item of your choice or size of your choice. 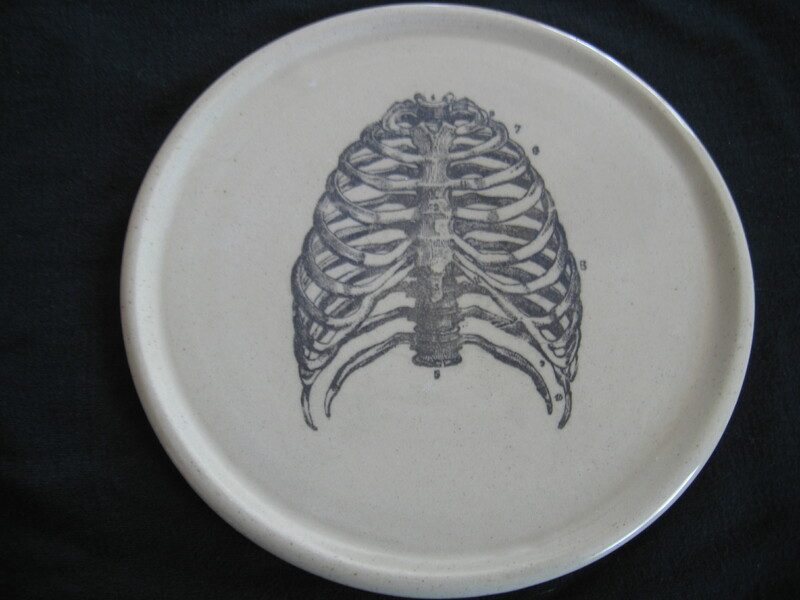 This large precious plate displays a nice rack…of human skeletal ribs. It measures roughly 9″ in diameter. 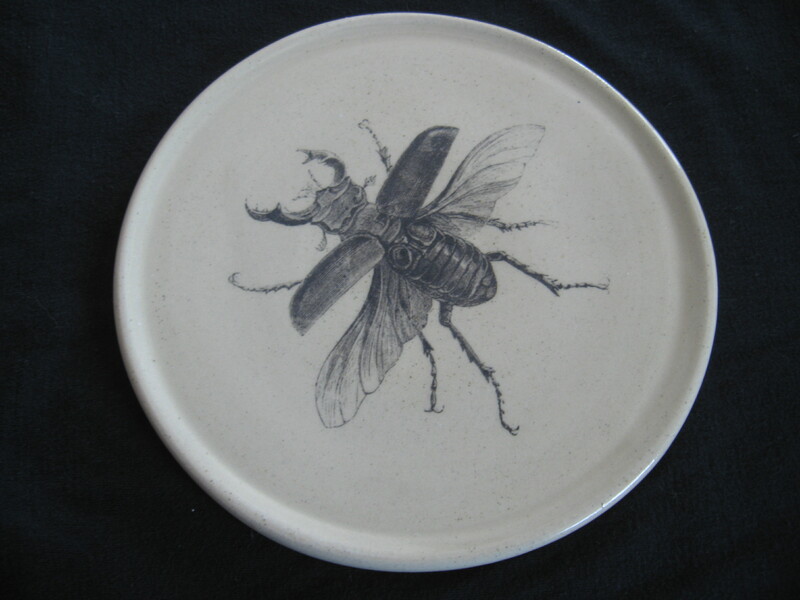 This large precious plate displays an intricate stag beetle in mid-flight. It measures roughly 9″ in diameter. 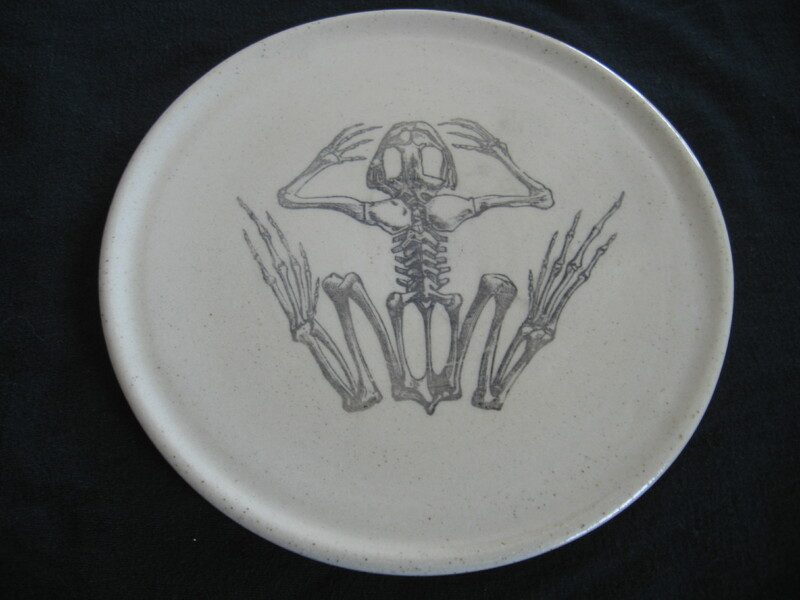 This large precious plate displays a frog skeleton ready to jump into your cupboard. It measures roughly 9″ in diameter.